Broccoli is a cancer-fighting super food. These little flowerets are packed with phytonutrients and fiber. There are so many ways to prepare broccoli, including grilling, sautéing, roasting, steaming, or adding it to soups and stews. This is a very simple recipe that you can use to add more broccoli to meals you may already be creating. Simply just wash, chop, and sauté these greens– serve it as a side dish or on top of whole grains (e.g. quinoa, wild rice) and beans or a roasted sweet potato. In a pan, sauté the garlic on medium heat. Wash and chop the broccoli. 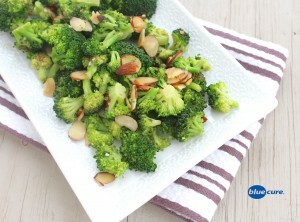 Add broccoli and slivered almonds to the pan. Continue to sauté until it reaches desired texture.